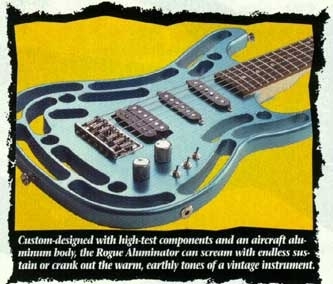 The Rogue Aluminator was featured for a few years in the late 1990's in Musician's Friend catalogues. It was truly a unique instrument. The slotted body was made from billets of aircraft grade aluminum. 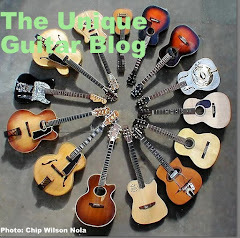 The history of this guitar is somewhat fuzzy, however here are the facts as I have researched them. The body shape of the Aluminator is reminiscent of a Fender Stratocaster. 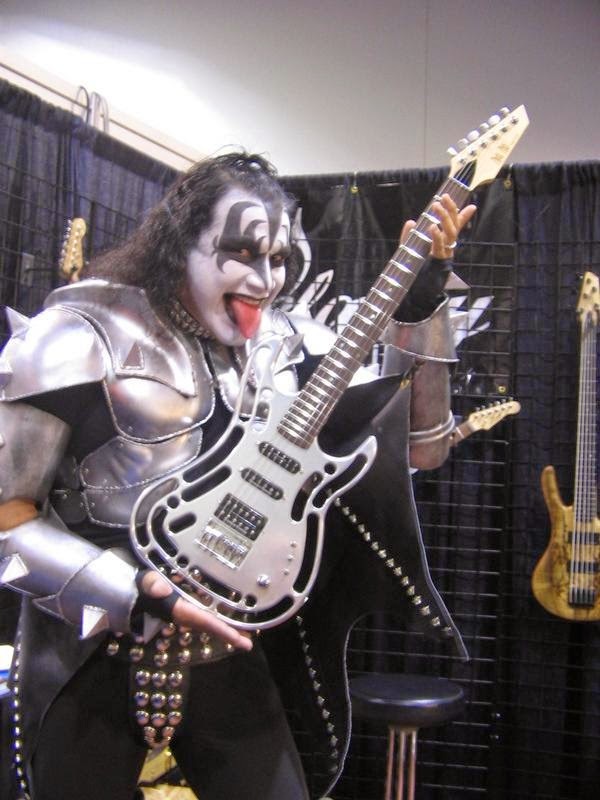 As mentioned already the guitar's body was made entirely of aluminum. The 25.5" scale, 22 fret, bolt-on neck was made of maple with a rosewood fretboard with dot markers. The six on a side headstock pointed and painted featuring the Rogue logo. Rogue has been the house brand featured by Musician's Friend for years. The instruments are made by other companies for Musicians Friend. The perimeter of the Aluminator body is slotted, thus allowing a decrease in the guitar's weight. The center section of the body contains the pickups controls and wiring harness. This guitar had a single volume and tone control. The potentiometer knobs were similar in appearance to those on a Telecaster. The Aluminator also came with 3 mini-throw switches; one for each pickup. This allows any combination of pickups to be off or on and gives 11 different sounds. The end of the body featured a non-trem Strat-style bridge with six adjustable saddles. Although it did not allow for the Kahler style, dive bomb sounds that were popular with the shredders of the day, the fixed bridge did help with sustain. It was offered in different MF catalogs from $549 to $699. The catalog I recall was asking $599 for the guitar. 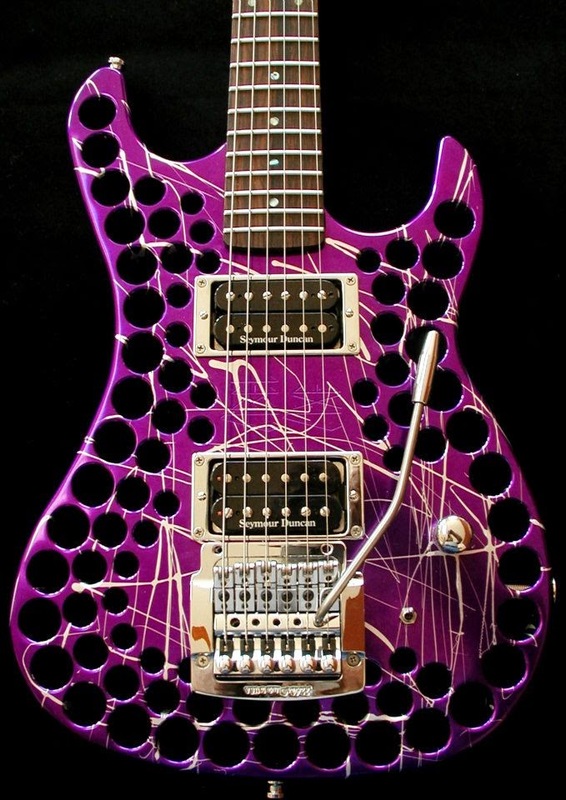 The guitar came in silver, purple, red or black. The Rogue Aluminator is sometimes confused with guitars manufactured by Able Axe. This is probably since it was Able Axe guitars that manufactured the Aluminator for Musicians Friend to sell under the Rogue Brand. 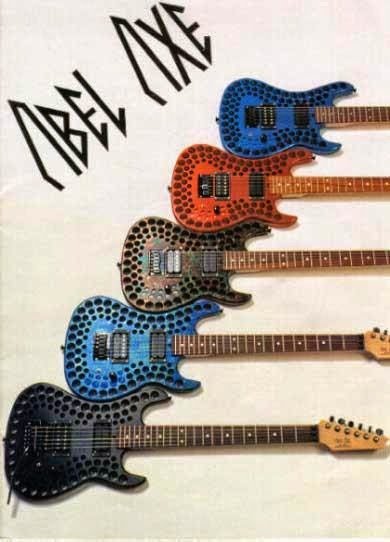 Able Axe was a guitar manufacturer started by Jeff Able. 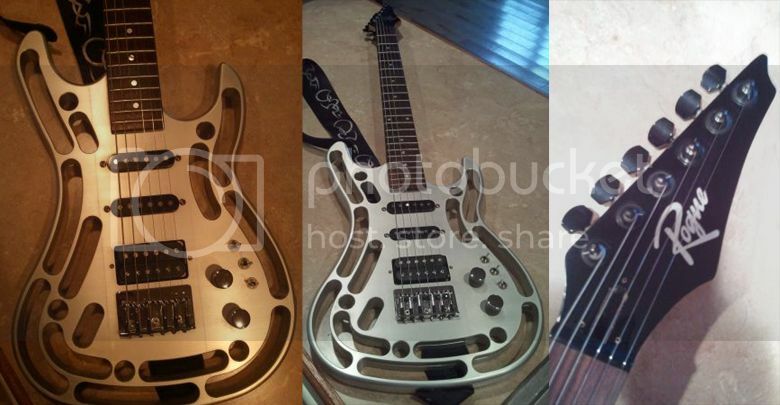 He selling guitars he built out of aluminum between 1994 through 1996. He started up again in 2001. Abel Axe guitars bodies are made of solid 6061-T6 aluminum billets and are only one inch thick. Less than 250 of the original Swiss cheese body style were made from ~1994-1996. The bodies had holes drilled into them. The holes were there to reduce the body weight. All of the guitars were designed and manufactured by Jeff were made at his shop in Bitteroot Valley,Wyoming. 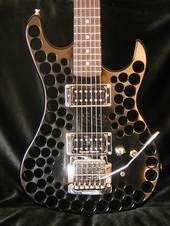 The original run, like the guitar pictured her featured holes drilled in the body. 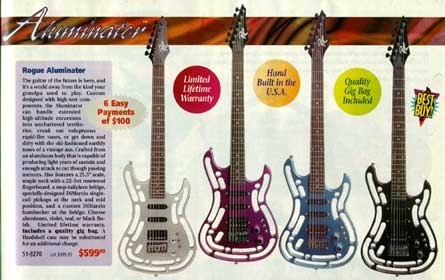 When hee started building again in 2001, the guitars featured slots instead of holes, as those on the Aluminator. All the bodies were coloured with anodized aluminum finishes. Most were finished in red, black, blue, violet, gold, teal, and some even multicolor. There rarest would be 3 with a green grass finish and 20 with a clear (aluminum) finish. These guitars featured a small Strat-type body and were equipped with either a trem or fixed bridge. Since they were made one at a time by Jeff there are subtle differences in hole beveling, spacing, and drilling depth. There was a small original run of single humbucker Abel Axe guitars made with slots instead of holes. The very first batch (a dozen or so less) were released withDiMarzio humbuckers: PAF Pro in the neck position and Tone Zone in the bridge position. These were replaced by Kent Armstrong pickups (which at one point were manufactured by Sky pickups) which were HRE-1 in the neck position and HSDE-1 in the bridge position. 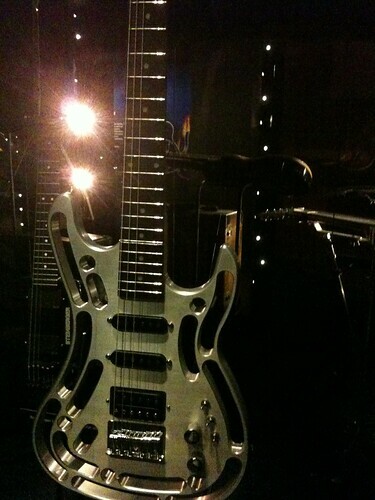 Many of these Able Axes featured a Kahler Tremolo and Sperzel Trimlock tuning pegs. The original guitar necks were made by Musickraft Inc. and were rosewood or maple fret boards on quarter- sawn hard rock maple. 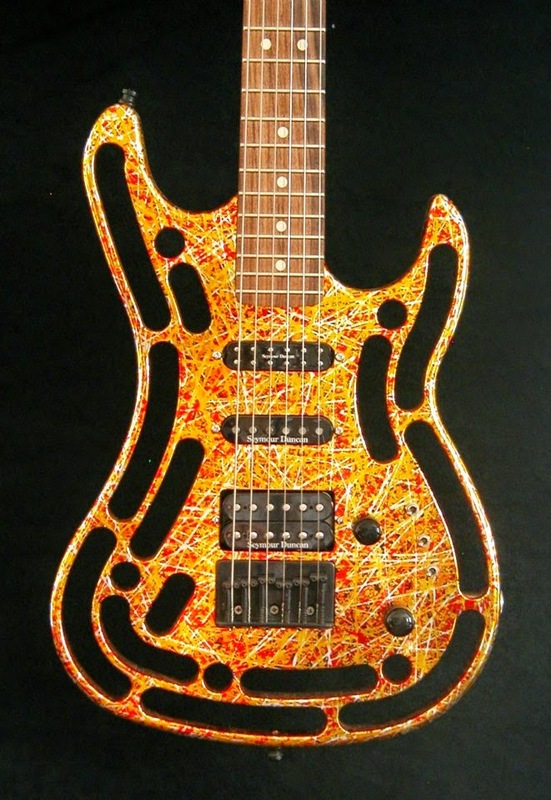 All guitars made after 2000 featured Warmothnecks were used. From 2007-present, necks are made by Delaney Guitars. Scale length on all necks: 25.5″. These pickups are now called are sold through www.wdmusic.com. In 2010 there was an article that Jeff Able was going to sell his guitars in partnership with Mike Delaney of Delaney guitars. There is no mention of this on the Delaney website. According to recent posts by Jeff Able’s daughter Jenna, Able Guitars will be back in business. There is a Facebook page for Able Axes. .The retail cost in 1994-96 for an Able Axe was $1395 to $1495. A variety of colours were offered, including plain stainless aluminum.